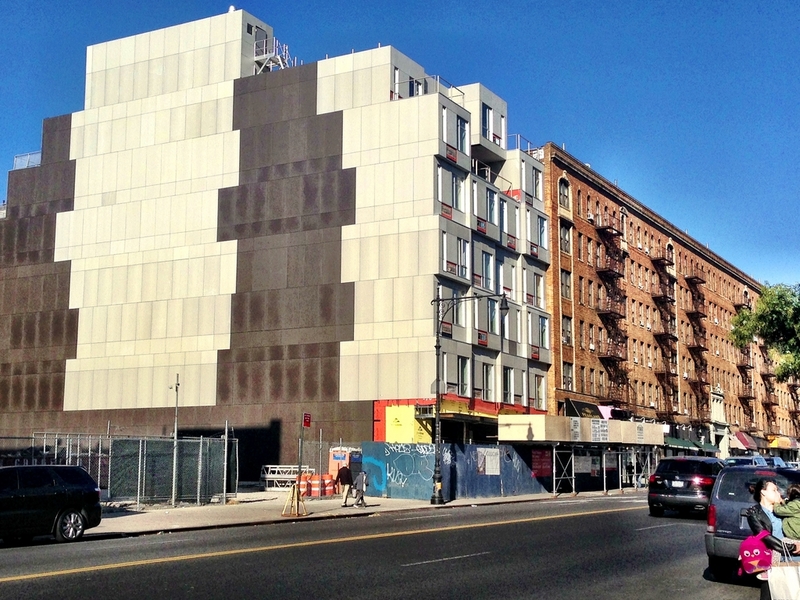 Broadway Stack, a 28-unit modular building, is just the first of many to come. By the end of the summer, uptowners can live in a Lego house: the city’s first concrete and steel, multi-story prefabricated building. 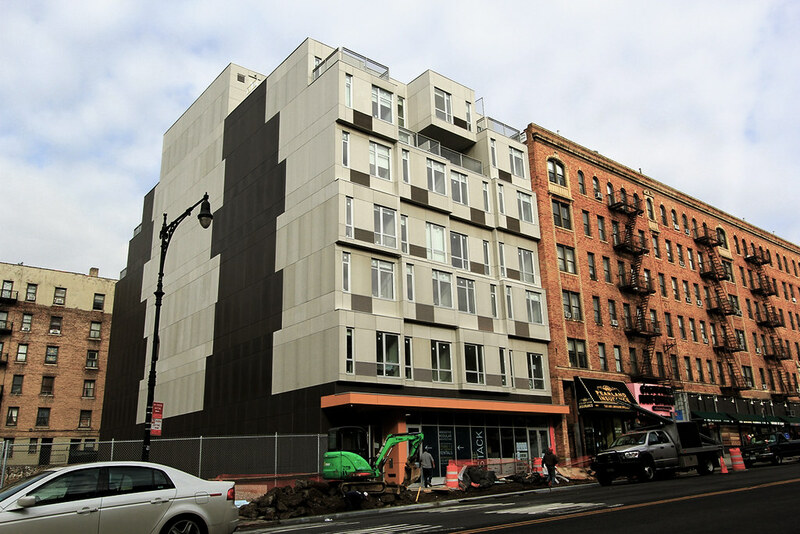 Broadway Stack is a 28-unit moderate-income apartment complex built with 56 prefabricated modules. 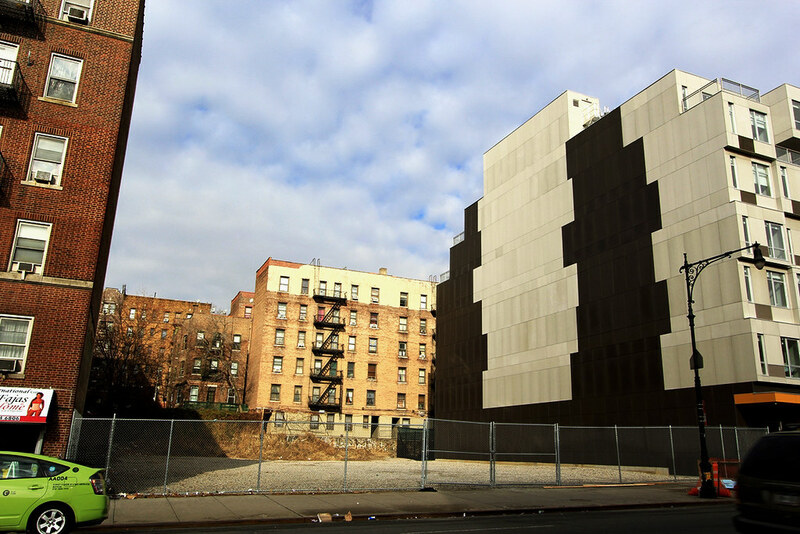 The modules were assembled off-site in a former subway car factory and then shipped to Inwood, where they are being stacked to form a seven-story tower. “It’s an exciting alternative method of construction,” said Stack’s architect Peter Gluck. 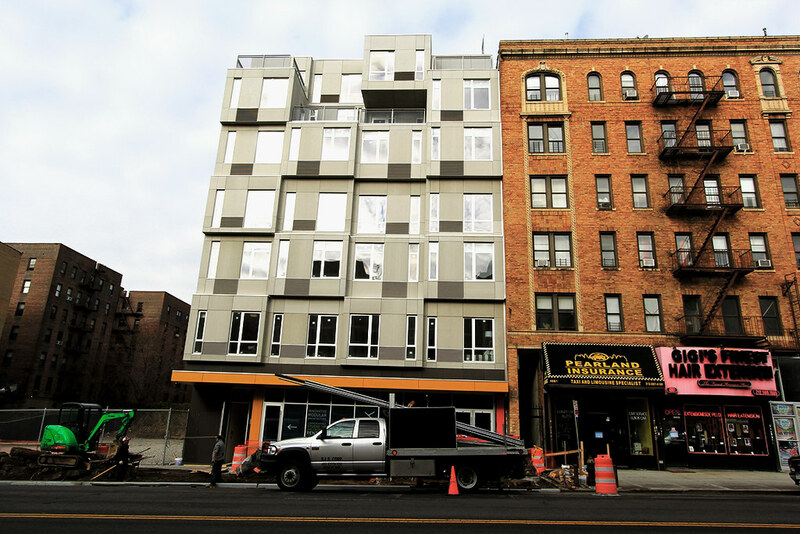 “As the country urbanizes there is more and more need for modern and low-cost housing, and this one response.” Prefabricated, modular construction is having a New York “It” moment. In Brooklyn, Bruce Ratner has broken ground on a SHoP Architect-designed modular building that would be the world’s tallest. Work is also in progress for nARCHITECTS’ My Micro NY, the winner of Mayor Bloomberg’s contest for ergonomically designed apartments. This is the future. The potential is endless. In a way it's a wasted innovation in NYC where money and politics dictates debate about buildings. Everyone from unions to community boards will resist a true turn towards this method of building. In less advantaged places of the world...prefabricated and modular buildings will change how people live. There is a fantastic initiative called Wikihouse that allows people to freely download basic house fabrication and assembly plans that can be plugged into a CNC machine for a "DIY" home. 3D printing will further push the boundaries of open source home building. We live in an exciting time. I think you have this backwards. In NYC it could be a revolution, because it would allow the builder to circumvent a lot of the friction and waste inherent in NYC's building trades. Someone could set up a factory in PA to crank out modules that meet NYC code, and just truck them in and bolt them together. Elsewhere, modular is already pretty well established. There are lots of modular wood frame manufacturers out there. I also don't think the 3D printing this is going to play here. For all the hooplah about it, it's mostly for small scale prototyping. If you want to crank out stuff in production, it's slow and inefficient. Last edited by BBMW; November 4th, 2013 at 09:05 PM. I think modular has a lot of potential and I'd like to see more of it, but it definitely has some drawbacks. As it is currently done it's great for apartments, but not a lot else. As with the pre-WTC steel-grid buildings, it doesn't allow for large open spaces. The modules need to be able to fit down city streets, so one of the dimensions is limited to that width x 2 (assuming open-sided modules were bolted together). Depending on the location, the other dimension would be affected by truck turning radii on the streets between there and the factory. The tighter the turns, the shorter the modules and the more of them it would take to bridge a large space. I guess you could bring them in with cargo helicopters, but that would probably negate the cost savings and there would be a public outcry about safety. There is also currently a lot of bulk between the modules. This seems like it could be overcome, though. They look kind of funky in those Kremlin wall colors - too bad that will painted over (according to the rendering). All panels all the time. The fronts will be paneled over similar to the way the side is right now. I drove by this morning on my way to drop off the rental and they were already at it with the last row or so of them on the side. 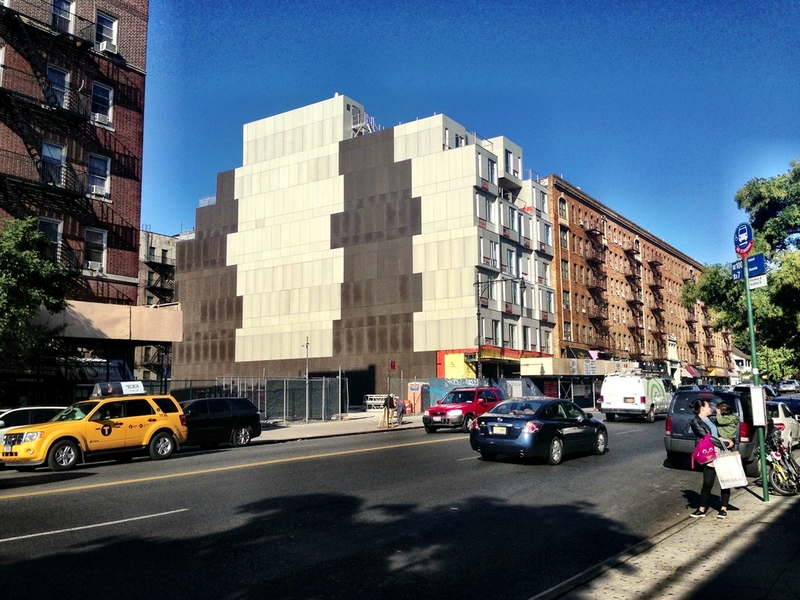 Pre-fab does not need to be blocky-modular. The city should allow larger buildings on the few development sites in Washington Heights and Inwood, especially along Broadway. Is this type of construction safe in earthquakes?